WHAT IS INTANGIBLE CULTURAL HERITAGE (ICH) ? 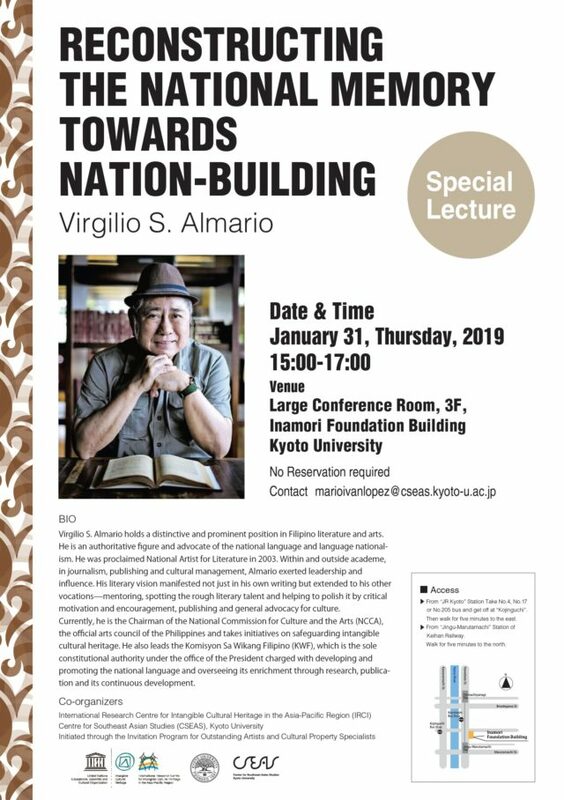 IRCI and Centre for Southeast Asian Studies (CSEAS), Kyoto University are going to coorganise the lecture by Virgilio S. Almario ‘Reconstructing the National Memory towards Nation-Building’ on 31 January 2019 at Large Conference Room, 3F, Inamori Foundation Building, Kyoto University, Japan. Mr Almario’s visit was realised through the Invitation Program for Outstanding Artists and Cultural Property Specialisits. For more information, please click the image of leaflet. © IRCI, 2011 - , All Rights Reserved.